Taste the First Asparagus of the Year! The Schreiber & Sons Farmer’s Market at Barnard Griffin starts May 1st, from 3-6pm. Shop the Schreiber & Sons Farmer’s Market on the Barnard Griffin Winery property from 3-6pm and stay later for an expert’s introduction to asparagus. 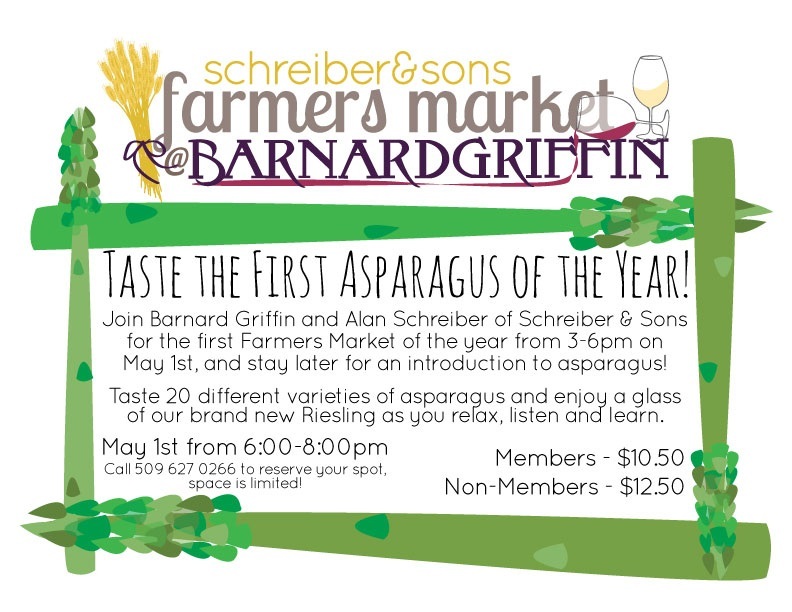 Al Schreiber will take you through a tasting of up to 20 different varieties of asparagus, and you’ll also enjoy a glass of Barnard Griffin’s Riesling as you relax, listen and learn. This man KNOWS asparagus! Call 509-627-0266 to reserve your spot for Asparagus Class. Class fee: $10.50pp for Barnard Griffin Wine Club Members and $12.50 for non-members. C’mon out and Taste Spring. See ya there! Artisan wines from the Barnard Griffin Winery will be served along with light fare on Friday, May 3rd for this Open House and Pottery Sale featuring decorative and functional works by Arlene Custer, Patrick Horsley and Victoria Gravenslund. 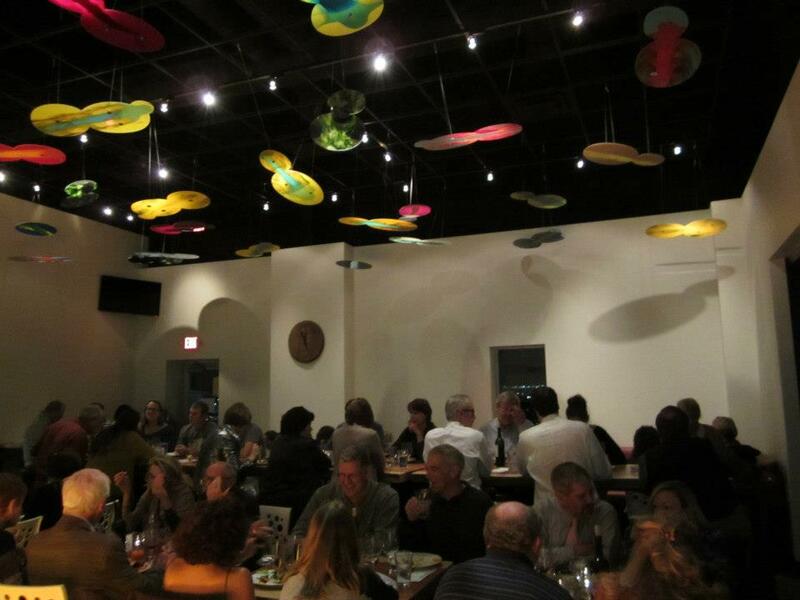 Bop, Shop and Sip in the only winery in the world with a glass arts studio on the premises. Plus, discover extraordinary fused glass art in their gallery created by winery co-owner and glass artisan: Deborah Barnard. Tasting Room Manager Kim Gravenslund and her staff welcome you to the Barnard Griffin Tasting Room. The TASTING ROOM is open daily from 10:00 AM until 5:00 PM. 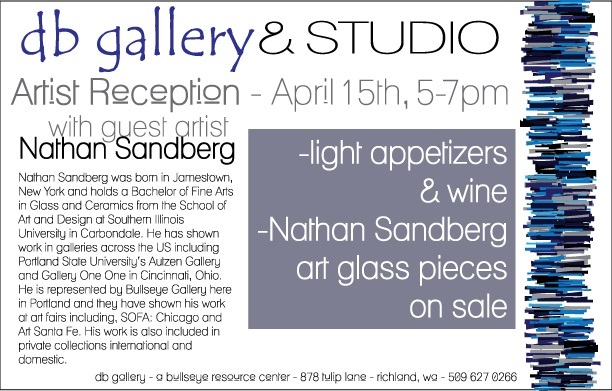 Reception for glass artisan Nathan Sandberg at ‘db’ Gallery & Studio within the Barnard Griffin Winery, Richland, WA April 15th from 5-7pm.